cyn.in update number 2 rolled out this morning, with minor bugfixes, and a few small changes in the functioning of the user interface. Presenting…The Preview window!Clicking on a file thumbnail now pops up a preview window. A few discerning users might have already found this window (earlier, it would only appear if the file name was clicked). If the file is an image you can view (and download) the image in its original size and percentage resized sizes as well. 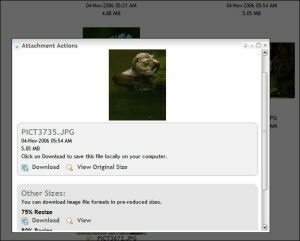 The image resizing options allow percentage downsized downloads which can be extremely useful for the digital asset management customers of cyn.in. You can upload your original large creatives and download them resized to your requirements.This functionality is supported by cyn.in’s unique dynamic image downsizer feature which allows image downloads at any percentage or resolution scale at high quality. More interface functionality is coming up on this soon, as usual, we’ll keep you posted right here.The file preview window also allows you to preview and download attachments of previous versions of the note as well - the cyn.in versioning system automatically creates new revisions for files that are updated. In cyn.in the lowest common unit of information is the note. Each note has a page view dedicated to showing note information in full glory - you can see all the SlashTags a note belongs to (bolded) as well as view details (if you’re a logged in member of the site) and have further interactions with that note. You can see this view (we call it the Single Note View) every time you create a new note, or when you click the note’s title, later.We now provide a link to go back to the home SlashTag from this Single Note View as shown in the picture along side. This will take you back to the Home SlashTag of the Space that this note is on, currently. When you login to a cyn.in site, you will see a new Edit Profile link next to your name. This link will take you to your profile page.In cyn.in all users have a common profile, that can be edited by clicking on this Edit Profile link. This link would earlier appear only for guest cyn.in users, we’ve now brought uniformity to the user interface - professional and enterprise site users will also now get this link next to their names. As always, any kind of feedback is welcome and appreciated. Just post in the support forums (available to all members of both Enterprise and Professional sites).